Moments of true love can be grand gestures or surprisingly simple ones. With my Oprah show coffee mug in hand, I turned on the TV just in time to see the Royal family arrive at Windsor castle and instantly got sucked in. I was hooked. Oprah was at the wedding and now my coffee mug and I were too. We just had different seats. And I wasn’t expected to wear a hat. The door to a Rolls Royce opened and out stepped an American actress, transformed into a stunning princess (and soon to be the very first Duchess of Sussex). 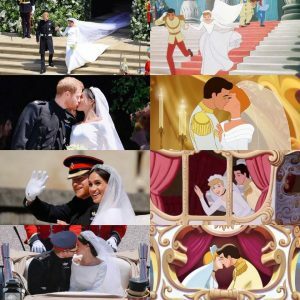 Of course, along with the whole world, I examined every beautiful inch of her from the Givenchy Haute Couture gown, the cathedral embroidered veil to the flawless earrings made to match the royal tiara. A stunning vision indeed. The look on Harry’s face, the ceremony by Bishop Michael Curry, the gospel choir and the electricity of love between the bride and groom radiated through TV screens across the globe. For a moment, the palpable love between them freed millions of people from this crazy and unsure world we live in. It unified us, gave us faith in humanity. It also proved that although we’ve been told “fairytales don’t really happen,” they can. They actually can. So, inspired by royal rock stars Harry and Meghan, I’m going to share two of the most romantic moments I’ve witnessed in person in my lifetime. Gather ‘round lovers of love, and grab a coffee mug, because I’m going to dish up some kiss and tell. Other people kissed and I’m gonna tell. About six years ago I was visiting Fort Lauderdale, Florida, in an effort to thaw from the New York winter. I was running errands, passed a drug store and realized I needed something so I pulled into a nearby parking lot to turn around and go back. I parked for a second to answer some texts and as I glanced up I saw a young Latin couple, probably in their late teens or early twenties, walking down the sidewalk. They were beautiful – he in jeans and a white cotton tank, she wearing a cotton summer dress in a 1950s cut. I couldn’t take my eyes off them. He was carrying a large suitcase in each hand and she had one just as big in her grip. I felt like I was watching “West Side Story” on a drive-in movie screen. A few drops of rain started to fall and he yelled, “Hurry!” (Well, I’m assuming he yelled hurry, it was a silent movie from my vantage point as my windows were rolled up and the a/c in the car on). She picked up speed behind him, lifting her luggage over her head to shield the rain. And just then the sky fell. Rain poured down. He looked back at her as he sprinted away but she was standing stock still in the downpour and started to cry. He stopped. He set his suitcases down. He walked back to her in what seemed to me to be a very forceful manner and with a dead serious look on his face. For a moment I thought he was going to hit her. My body tensed at this scene playing out when he reached around, placed his hand on the small of her back, pulled her body against his and gave her the most passionate kiss I’ve ever seen in my life, onscreen or off. They kissed and kissed and kissed, their soaking wet bodies pressed together in the Florida rain. When I “came to,” out of my reverie at watching these Latin lovers, I realized I had the biggest possible smile on my face. As she came out of their embrace, she turned her head slightly and made eye contact with me through my windshield, and her smile became as big as mine. Then she looked at her beloved and pointed towards me. They both smiled as they ran off, suitcases in hand. Three years ago in Paris, my handsome partner and I were looking forward to dinner at Le Jules Verne in the Eiffel Tower, a romantic 50th birthday gesture to me from my love. When we arrived the front dining room was full so they directed us to a rear dining room where we were the only other people except for a couple seated by the window. There was some confusion as to where they were going to seat us – my partner had reserved a table by a window and they tried to seat us by the back wall – and while he went to sort it out with the manager I was left standing alone in this room, 410-feet above Paris. Well…alone except for the couple seated at the window. The man rose from his chair, got down on one knee and began to propose to the woman. Right there, in the sky in Paris. I started to panic. Oh no. I tried to will myself to become invisible but when that didn’t work I got stern and told myself “Pull it together, Robert” and instantly pretended to be absorbed in my phone, acting like I was texting, but secretly took a photo of them. We soon got our own window table and the room started to fill with other diners. I was about to tell my partner what happened while he was fixing our reservation when I noticed my phone battery was low. I excused myself, walked over to the newly engaged couple and asked if they spoke English. They did. I hemmed and hawed my story, afraid they would think me the ultimate peeping Robert and explained my phone was about to die but I wanted them to have the picture of their special moment. They were so grateful and kind, and emailed the photo to themselves. Before they left, they sent a bottle of Dom Pérignon to our table, making my birthday dinner above Paris one of the most amazing moments of our trip. That was the last and only time I ever saw them, but those lovers, like the rain soaked lovers in Florida, will forever be in my memory and my heart. If they happen to read this, merci beaucoup for the Dom and I hope your wedding was as lovely as your proposal. It was an honor to witness. Even though I pretended I wasn’t. Wow, you are so romantic, why am I surprised! Thank you for sharing these love stories with us-“love will conquer all”! My favorite moment of the wedding was when Meghan looked up so lovingly at her groom and with such joy, that it will remain indelible in my heart and mind. p.s.You are quite the writer, as well as the very talented designer. Keep at it. You may be in the wrong line of business. Do you dabble in romance novels? If not, you definitely should as I found myself swept away in your beautifully written memories. Wow Robert Bullock! No wonder you chose to be a bridal designer..you’re such a romantic soul!! Those were wonderful stories..thanks. Beautiful stories of love. I’m sure this kind of beautiful romance is all around us, you just happened to be lucky enough to be a witness. I’m guessing these encounters inspired bridal gowns from your masterful art. Thanks for sharing.